Nearly 275 students from Bryan Station High School’s Academy of Medical Sciences got a firsthand look at college life thanks to a recent MED Talk. 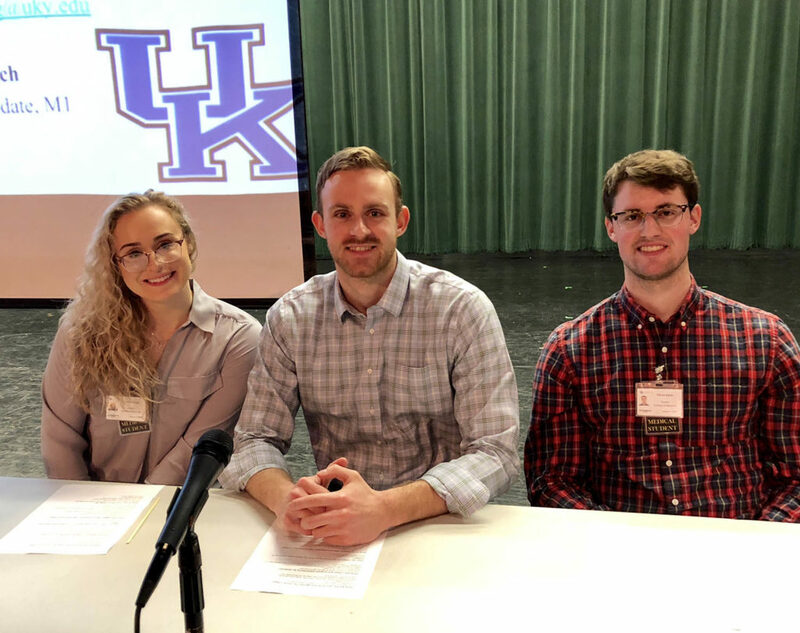 Led by a panel of college students from various healthcare programs at Eastern Kentucky University (EKU) and the University of Kentucky (UK), the event promoted an open dialogue between future generations of industry professionals. 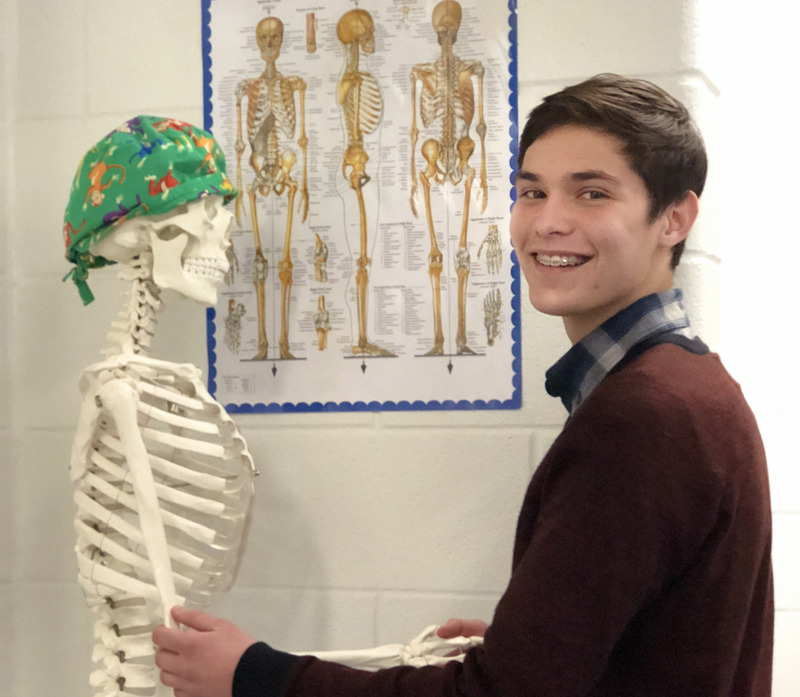 As part of their rigorous, career-themed curriculum, Bryan Station’s Medical Academy students participate in a MED Talk every month to connect with real-world medical professionals, patients and students. From discussing how selective healthcare programs in college can be, to how students can stand out from their peers in today’s highly competitive medical landscape—Academy students took advantage of the opportunity to listen to and learn from emerging industry leaders. 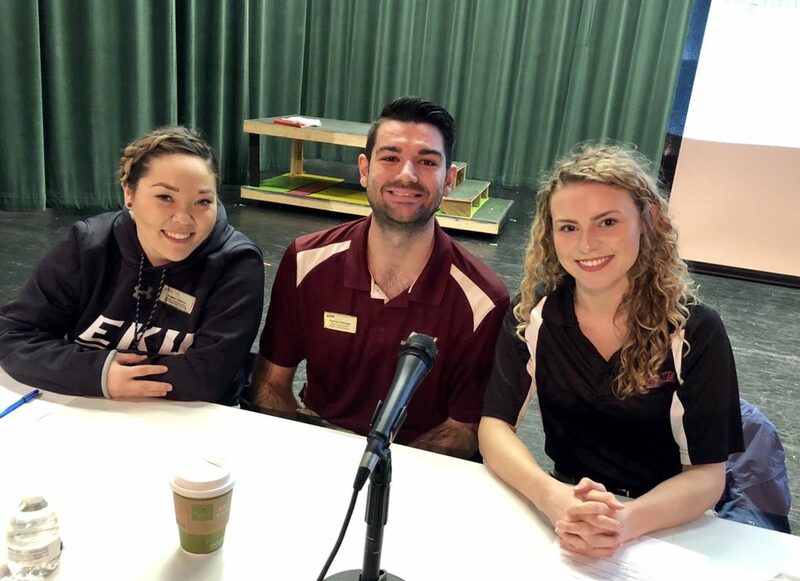 MED Talk participants from EKU included Tanner Eldridge and Kaitlin Oshiro, both Athletic Training program students, and Occupational Sciences student, Alyson Crawford, who will begin the school’s MS Occupational Therapy program next year. Participating from UK’s College of Medicine were Patrick Keller, Abigaile Roney and Andrew Wodrich. Pictured from left to right are UK College of Medicine students Abigaile Roney, Andrew Wodrich and Patrick Keller. Pictured from left to right are EKU students Kaitlin Oshiro, Tanner Eldridge and Alyson Crawford. “With anything in the healthcare field—it’s all about helping patients. Colleges want to see that you’ve done some volunteer work and high school is a great time to start with that,” said Patrick. Alyson continued, “I like to volunteer to stay motivated. If I’m in a nursing home working with residents, that’s my biggest motivation.” Tanner echoed their sentiments adding that volunteering helps to “build your identity as a healthcare provider” down the road. “One of the biggest things you can do now is get exposure. If you have a particular interest that you know of, try to talk with someone in that field to see what it’s really like. You can reach out, like in our case, to a doctor in the Lexington area and ask to shadow them. Most doctors are excited to have students who are interested, passionate and driven come and learn from them,” said Andrew. “Take the time to know that in college, school comes first. Time management is a huge thing. When you’re waiting between classes, take an hour to study and make the most of that time,” said Kaitlin. “In college you’ll be doing laundry, cooking yourself dinner and waking up to your alarm every day. Think of everything that happens in your life—you’re now accountable for yourself. You have be able to clean, go to the grocery store, and still go to school and study and work hard,” added Andrew. Studying is essential to maintaining the highest GPA possible, which all panelists agreed is critical to their programs. It’s all about finding ways to make studying collaborative between friends and peers—but also setting limitations. “Have something you look forward to and set limitations. I study every day from 7:30 a.m. to 5:30 p.m. but after that, I’m done. I go to the gym and look forward to that. You need to be more than just your program. You are a well-rounded person. Make time for yourself,” said Abigaile. “Whatever you are most interested in now—pursue that. Do what you love and it will help you develop into the person you’re destined to become. Be passionate about something and do it well, and to the best of your ability,” said Andrew. “And if you manage your time correctly, you will have time to go out with your friends and enjoy college while you can. College has been the best time of my life,” said Alyson. 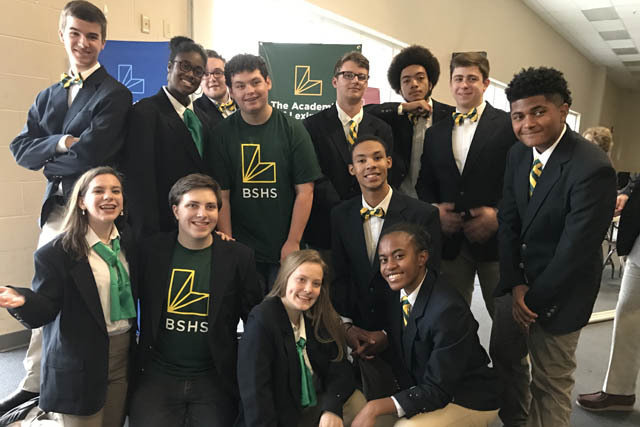 If you are an individual in the medical industry who would like to provide real-world experiences and opportunities to Medical Academy students at the Academies of Bryan Station High School or Health Sciences Academy students at the Academies of Frederick Douglass High School, we’d love to hear from you! In addition to seeking volunteers for speaking opportunities such as MED Talk, we welcome job shadowing and field trip experiences. We are also very excited that beginning Fall 2018, the Academy of Medical and Emergency Services will be implemented within the Academies of Tates Creek High School. Imagine a high school that’s completely designed, engineered and built for the future of education. A high school that’s complete with a digital media lab that has the capacity to design its own virtual reality environments. One where every desk and chair is on wheels to facilitate teamwork and group learning. Where Chromebooks meet textbooks in every student’s backpack, and where blackboards are replaced by mobile interactive flat panel monitors to facilitate collaboration in flexible learning spaces. 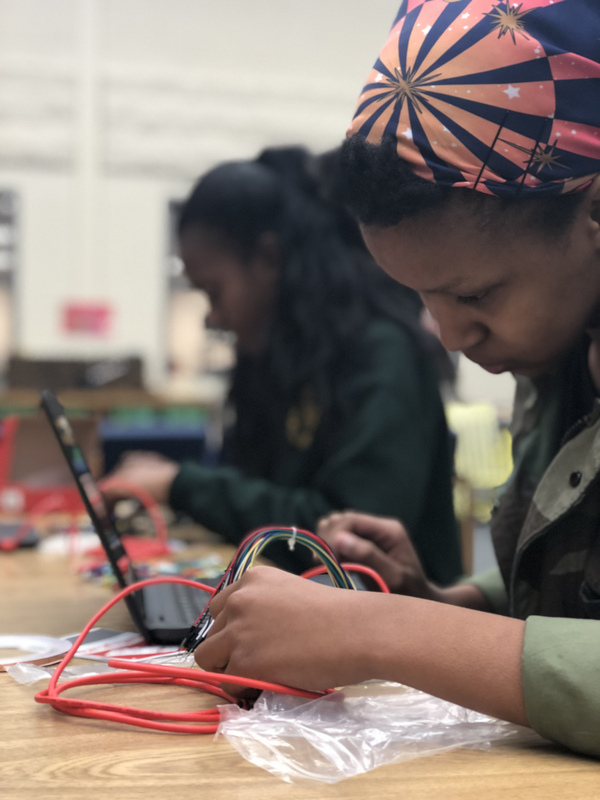 For students at the Academies of Frederick Douglass High School, this isn’t a glimpse into the future—it’s their everyday reality. Frederick Douglass was conceptualized and constructed from the ground up in anticipation of the ongoing changes in technology, education and sustainability that lie ahead. 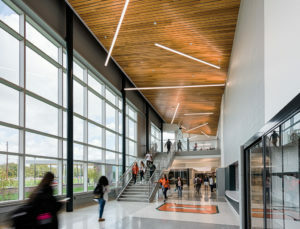 The school was brought to life through a long-term collaboration among Fayette County Public Schools, Perkins + Will and Tate Hill Jacobs Architects which aimed to create a collaborative community that ensures all students achieve at high levels and graduate prepared to excel in a global society. 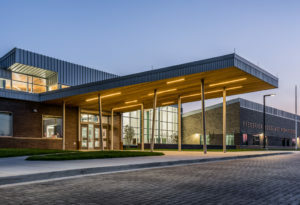 Currently, Frederick Douglass has implemented four Academies (or small learning communities), each of which has its own wing of the school and includes state-of-the-art features that facilitate Project-Based Learning (PBL). 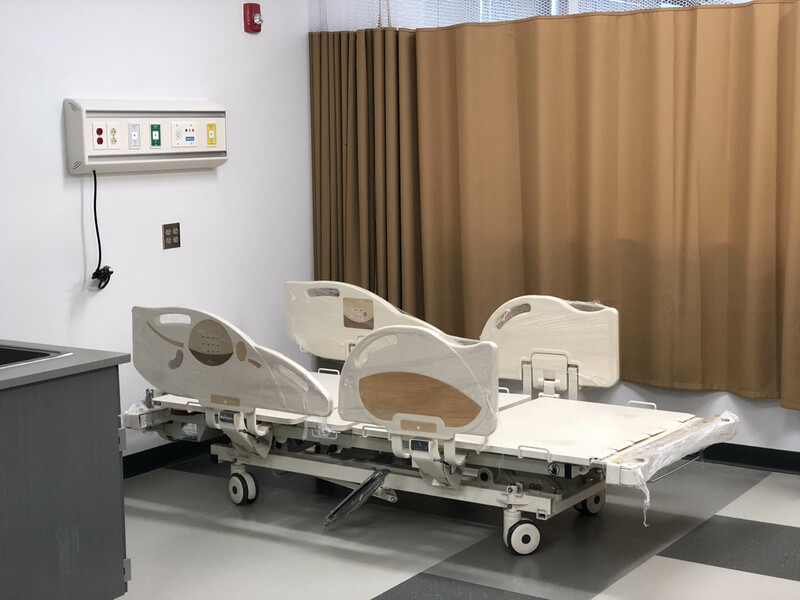 For example, the Health Sciences Academy is equipped with real hospital beds and medical mannequins, offering students hands-on, real-world learning opportunities. 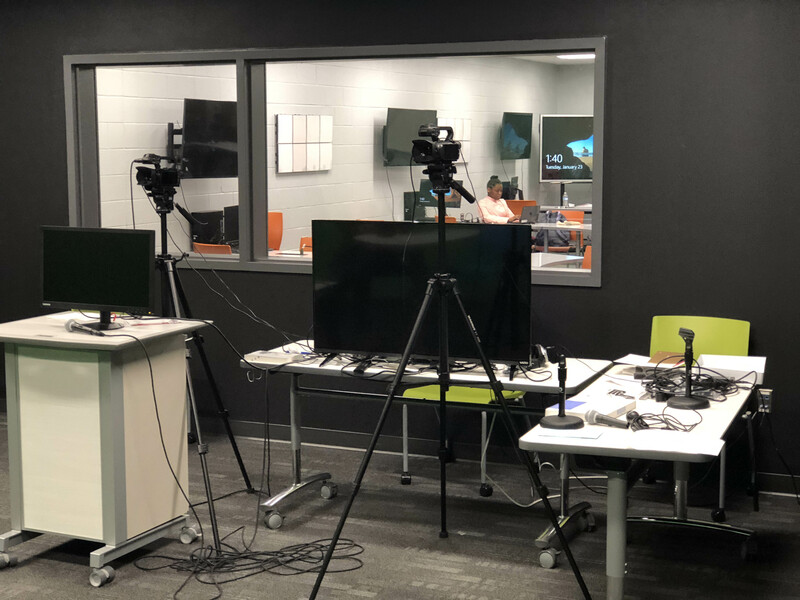 Additionally, the Technology Academy features 3D printers and Oculus Rift VR headsets which allow students to go on virtual field trips without having to step outside of their Academy. 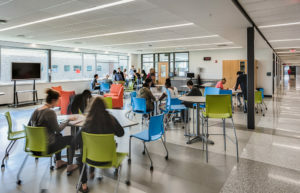 Each Academy also features a common space for students and teachers to utilize both during and in between classes. 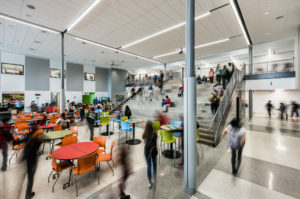 Susan Stokes Hill, principal emeritus at Tate Hill Jacobs Architects, said stepping back from the standard mode of programming and viewing the school from an emerging 21st Century perspective was key to the design process. 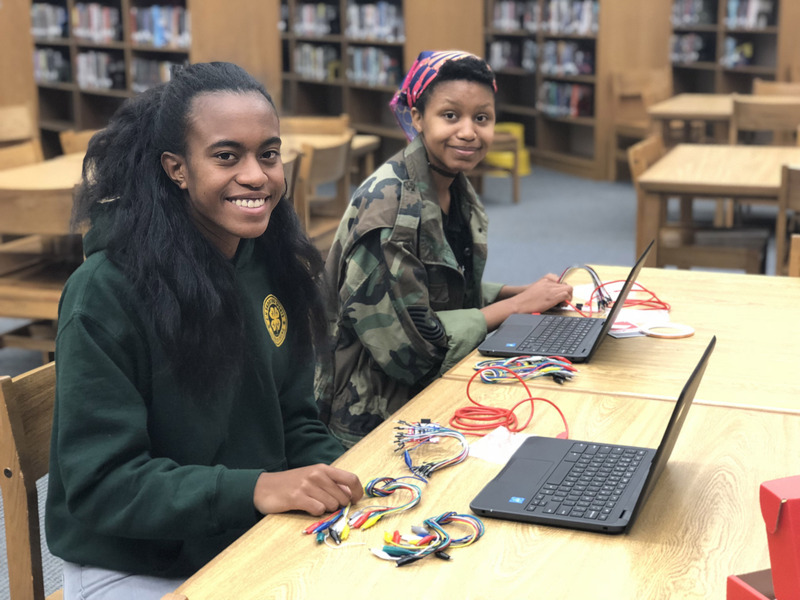 “We had to consider how this new school would support the most current, trending ideas of education for high school students while also providing flexibility for dynamic changes in the years ahead,” she said. And this forward-thinking approach to architecture did not come about on its own. 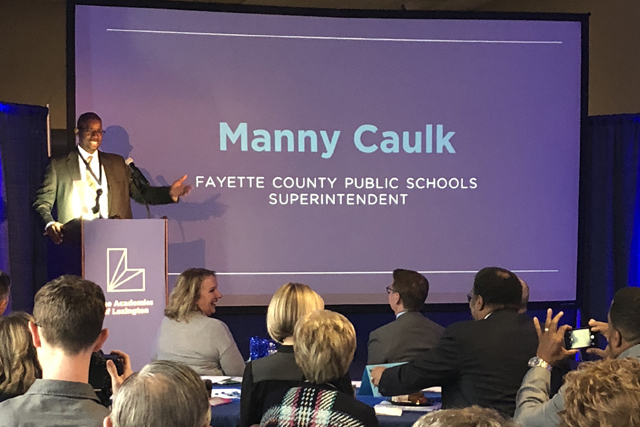 Hill noted that it was the result of a highly collaborative process including educators, administrators, student focus groups, teacher focus groups, design professionals and the community all working together to develop a new vision for the future of high school. 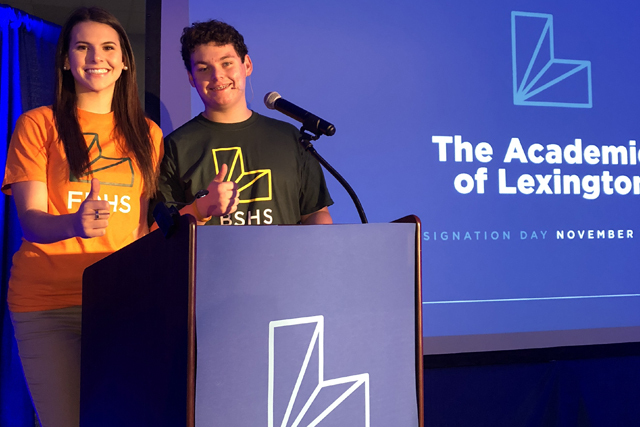 “We set forth to create a building that could inspire and change with the constantly evolving challenges of a new century, and to embrace the idea that student-led, teacher-facilitated learning is a pathway to developing critical thinking for the future,” said Hill. 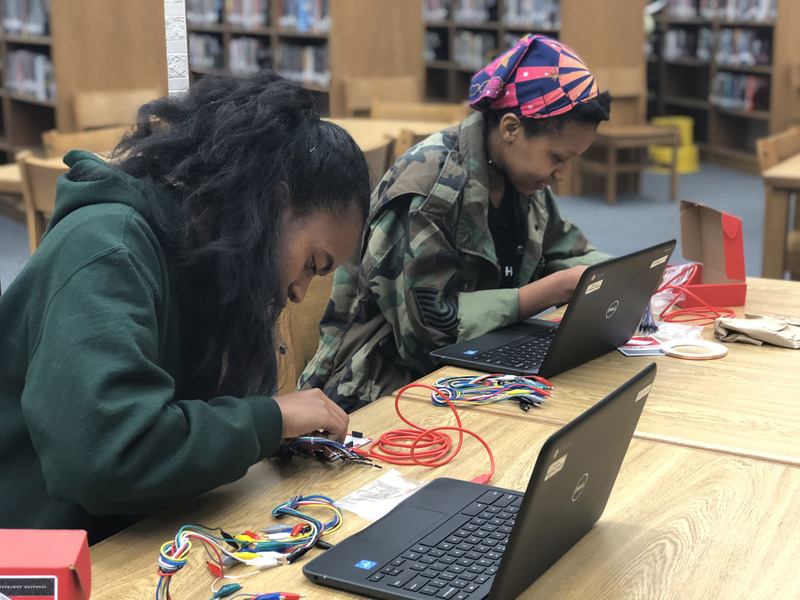 Academy Coach Shawn Hinds added that the school’s approach to being future-ready spans beyond the building’s structure as the team at Frederick Douglass has all adopted a culture of transformative thinking. “I’m really proud of how all of our teachers have accepted the challenge of doing something different through our Academies. 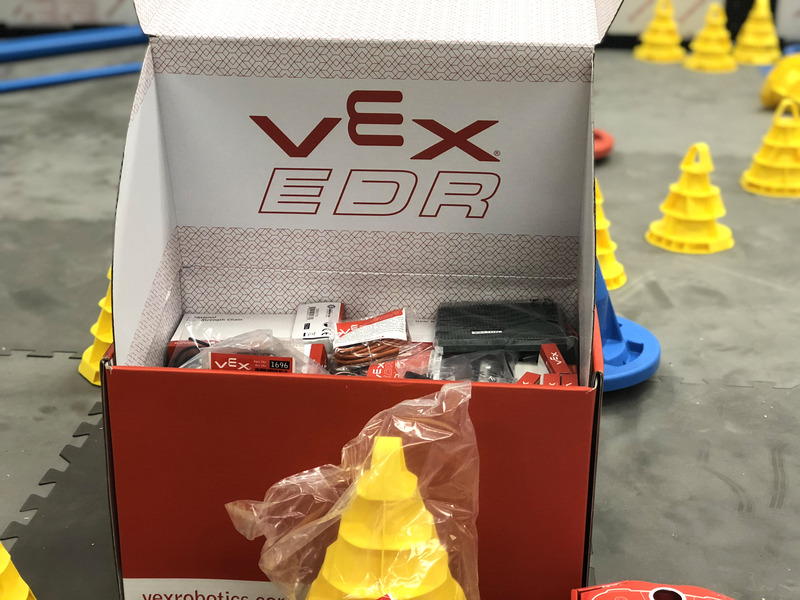 We started with a brand new team, and every single team member has supported the idea that we have to provide something different to our students. Our teachers are revolutionaries,” he said. And it’s indeed Frederick Douglass’ new approach to education that has been lauded perhaps even more so than its high-tech facility. Seth Spears, who was previously homeschooled, actually enrolled at Douglass to experience public school for the very first time after learning about the Academy model. “My parents and I discovered the advantages of Academies and the opportunities that they open up, and that was a major draw. It’s also a plus that I will hopefully graduate with some college credit,” said Spears, a senior in the Health Sciences Academy. Principal Lester Diaz was careful to note that the 287,125-square-foot building itself is only as good as what goes on within it. “It’s the philosophy behind Douglass that makes us special. Nothing is as important as our people—the passion and caring attitude that our students and teachers bring on a daily basis. That’s the foundation of our success,” remarked Diaz. For more than 16 years, Tates Creek High School’s Amanda Wickersham has dedicated her career to shaping the lives and education of students in Lexington. 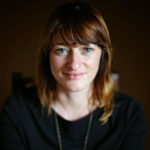 Prior to her current role as Academy Coach, she served as Department Chair, taught technology and engineering, and was a district liaison for the Kentucky Department of Education (KDE). Describing Tates Creek as her “home away from home,” Amanda’s passion for providing high school students with the support they need spans far beyond the classroom. 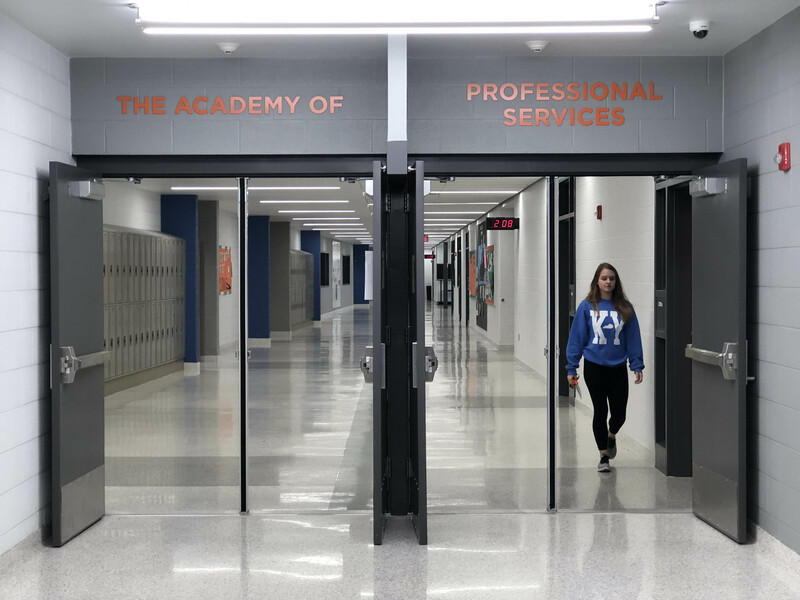 And just a short walk down the hallway from Amanda at Tates Creek, you’ll find Freshman Academy Principal Meredith Bordas—a woman whose devotion to paving bright futures for students has been a force at the school since 2005. 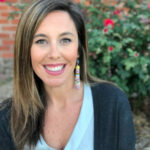 Her commitment to helping teenagers learn and grow throughout high school was solidified her first year of teaching when she taught ninth grade English. Since then, Meredith has served in various capacities including Language Arts Coach and Reading Specialist/Building Assessment Coordinator where she helps teachers incorporate literacy strategies into their classrooms. 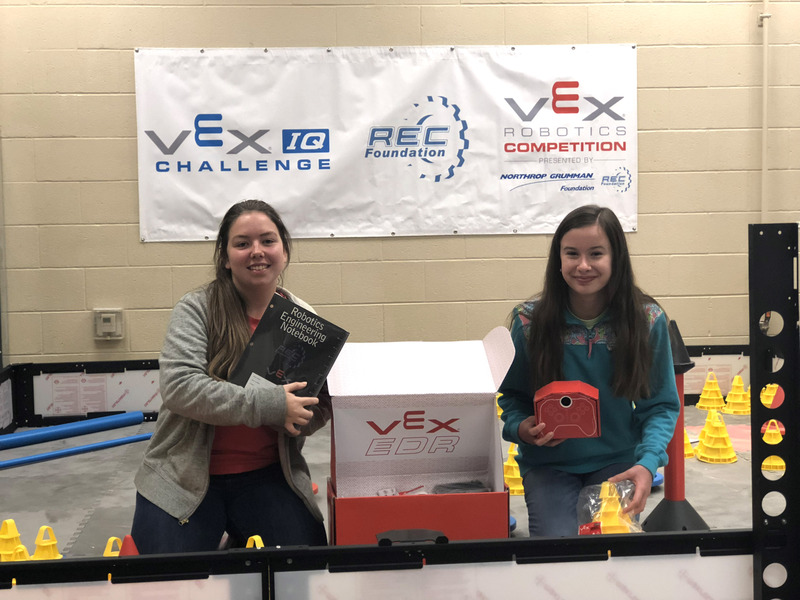 Together, Meredith and Amanda have been championing The Academies of Lexington movement since launching Tates Creek’s Freshman Academy this fall. To increase awareness within the community about the transformative change that’s underway at the school they’re so proud of—we recently sat down with them to get their perspectives. Q: Why do Academies matter so much for the future of education? Academies help bridge that gap. Two of the foundational pieces of the Academy model are Project Based Learning (PBL) and work-based learning experiences. 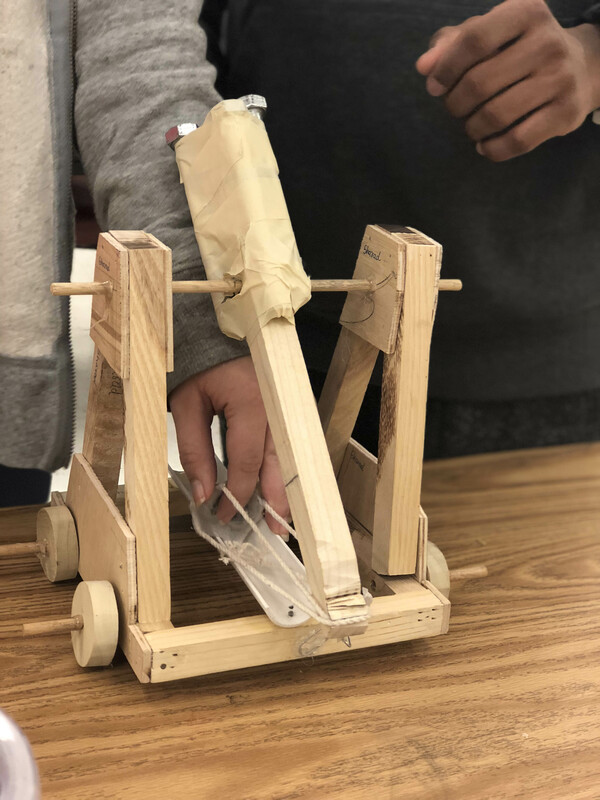 Teachers collaborate on both small scale PBL activities in individual classrooms, and large scale PBL across disciplines, which is statistically proven to engage students. 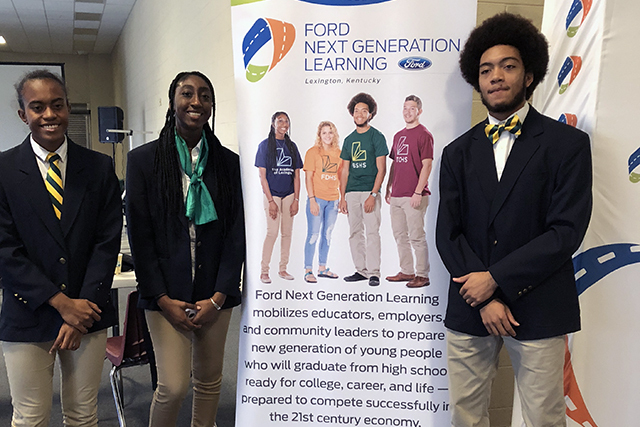 Students also receive work-based learning experiences, which include job shadowing, internships, plus co-op and capstone projects—all of which add up to more interconnected and relevant learning. Q: How will Academies enhance collegiate and workforce performance? Amanda: The Academies model is a multifaceted approach that combines college preparation with a career focus. Students continue to receive rigorous academic instruction, but are also taught how their core classes are relevant in the real world. Students will graduate with the academic knowledge base, and with the essential skills they’ll need to be productive in a working environment. While Tates Creek currently only has a Freshman Academy, we look forward to moving toward a career-themed Academies model for all of our students beginning fall of 2018. 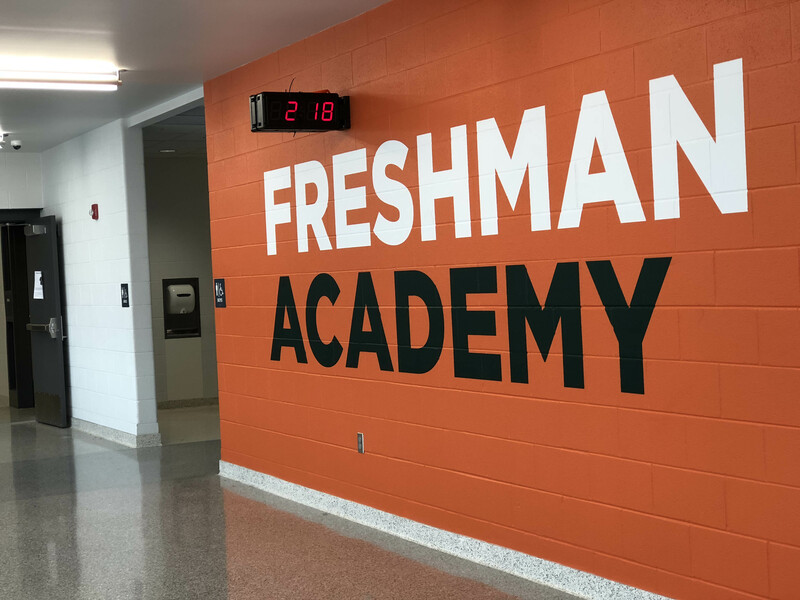 Q: Can you tell me more about Freshman Academy? Meredith: Our Freshman Academy provides a nurturing environment in which our ninth graders can more smoothly transition to high school. All of our freshmen are divided into cadres with the average class size being smaller than usual, which allows our teachers to really get to know their students. In fact, I would say that our teachers have gotten to know these kids more in the last three months than they have in any given school year—and that’s really cool. Our students are also really loving their Freshman Seminar course because they get to explore what they like, and think about what career path they may be interested in for the future. 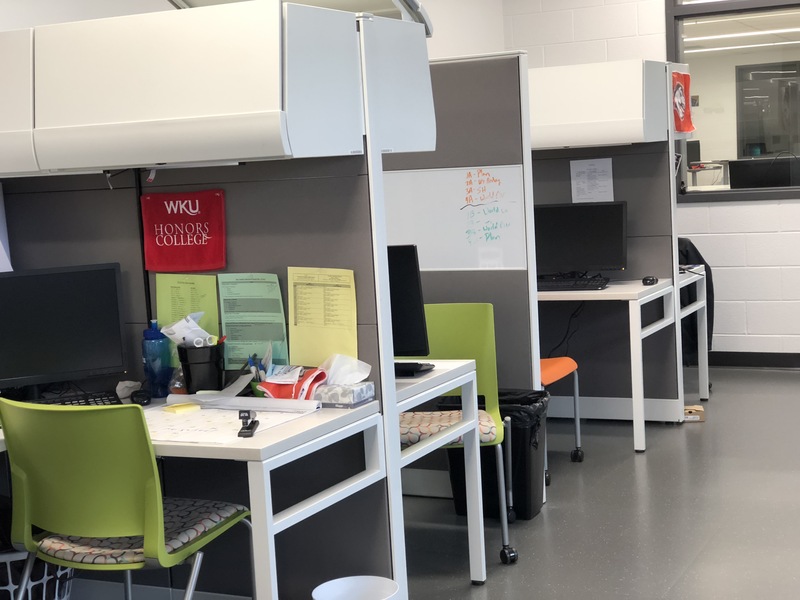 It’s also great because they are discovering that their voice is going to dictate a lot about their futures here at Tates Creek—and they won’t just be plugged into a schedule. We need real-life professionals coming in and showing our students what success looks like. Every school in our district could use that, as well as continued support from parents in helping students discover their true interests. 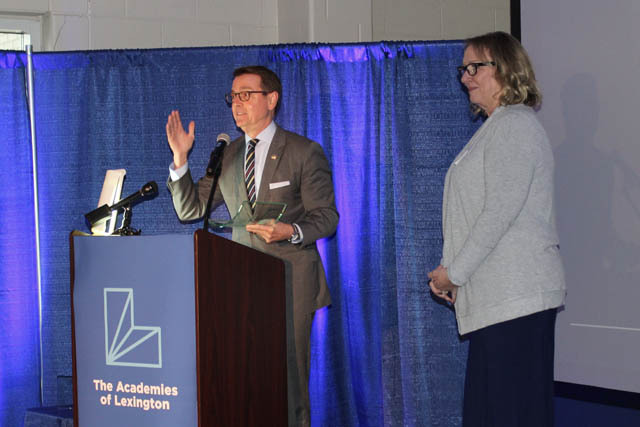 Learn more about how the Academies of Lexington are revolutionizing what school can be for students at Tates Creek, Bryan Station and Frederick Douglass high schools by visiting our website at academiesoflex.com.